Scientists have discovered a new type of comet, one that is nearly tailless like a Manx cat, that may be a leftover chunk of the same stuff that formed the Earth billions of years ago. The newfound comet, shown here in an artist's depiction, is returning from the Oort cloud at the solar system's edge. A new kind of comet that is nearly tailless has been discovered — and the surprises don't stop there. The new comet recently returned from the edge of the solar system but may have originated much closer to the sun, scientists say. In fact, it may even reveal clues about the building blocks of Earth. 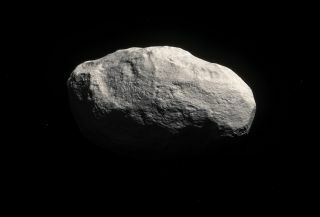 Given the nearly tailless appearance of this new comet, the scientists named it a Manx object, after Manx cats, which are mostly tailless. "I always tell my students that science is 99-percent hard work, sometimes tedious, because the details really matter," said study lead author Karen Meech, an astronomer at the University of Hawaii. "But there is 1 percent of the time where there is the thrill of excitement, when you discover something new and unexpected and you know it is important," she told Space.com. "This was one of those times!" Most known comets come from the Oort cloud — a cold, giant shell surrounding the solar system like a giant, thick soap bubble. Scientists estimate that the Oort cloud is made of trillions of icy bodies that lie as far as 100,000 times Earth's distance from the sun. Astronomers focused on a comet named C/2014 S3 using the Pan-STARRS telescope in Hawaii. The comet, discovered in 2014, is a little more than twice as far away from the sun as Earth is. The 860-year-long orbit of the comet, known as S3 for short, suggested it came from the distant Oort cloud. Unlike other known comets, S3 was nearly tailless — up to 100,000 times or so less active than typical comets on similar orbits. Comets grow more active when they approach the sun and their ice heats up, becoming the gas making up a comet's tail. The lack of activity from S3 suggests it was ice-poor instead of ice-rich, unlike previous known comets from the Oort cloud. Follow-up observations of dust in this comet's stubby tail — conducted with the European Southern Observatory's Very Large Telescope in Chile and the Canada-France-Hawaii Telescope — revealed that S3 more closely resembled stony asteroids from the asteroid belt than a typical comet. Their model of this new comet's dust confirmed that it came off the comet itself, as opposed to originating from a piece of rock that may have collided with the comet. This image of the weird tailless Comet C/2014 S3 (Pan-STARRS) was made from observations by scientists using the European Southern Observatory's Very Large Telescope and the Canada-France Hawaii Telescope. It is the first rocky comet ever found, scientists say. Because of their proximity to the sun, Earth and the rest of the inner solar system have relatively little ice compared with the outer solar system. This newly discovered comet's lack of ice suggests that, although it came from the Oort cloud, it may have actually originated in the inner solar system. "It is very exciting — S3 would have been kicked out while the Earth was being formed, possibly even by the early-days Earth," Hainaut told Space.com. "S3 would then be a planetesimal like those which formed the Earth, but preserved since that time in the cold of outer space." "We already knew of many asteroids, but they have all been baked by billions of years near the sun," Meech said in a statement. "This one is the first uncooked asteroid we could observe — it has been preserved in the best freezer there is." Previous research suggested that Manxes that are not rocky also exist — for instance, dead comets that have lost most of their ice. "These icy Manxes make the count of the rocky ones more difficult, as one has to determine if a Manx is rocky or icy, which is tricky," Hainaut said. It remains uncertain what portion of the Oort cloud is made up of rocky Manxes. "We are now trying to measure this fraction," Hainaut said. "As of today, we know that the fraction of rocky objects is small. Otherwise, many Manxes would already be known — 1 to 500 to 1 to 5,000 or so, but we don't know yet how small." This illustration shows the most likely orbit for Comet C/2014 S3 (Pan-STARRS), the first-ever object found to be on a long-period cometary orbit. The comet's current orbit takes 860 years to complete one trip around the sun. Recent models of solar system formation suggest that gravitational interactions between the planets may have slung matter from the inner solar system outward, with each model predicting different amounts of inner solar system material in the outer solar system. Discovering how many comets are rocky Manxes in the Oort cloud might help narrow down which of these models might best explain how the solar system was born. The researchers' statistical analyses suggest that if they can find 50 rocky Manxes, they can begin discriminating which models of solar system formation might be likely or unlikely. "Based on that number, we are now asking for telescope time on various telescopes to track these objects," Hainaut said. Further analysis of the compositions and other features of the rocky Manxes might help shed light on how the solar system has evolved over time. "It is very exciting to know that this rock [S3] is likely a building block of the Earth, or at least of the rocky planets," Hainaut said. "We can now study it or other similar ones we are now observing and learn more about the Earth and its formation." The scientists detailed their findings online April 29 in the journal Science Advances.